H&M Hennes & Mauritz of New York, N.Y., is recalling about 1,040 children’s bathrobes sold in the U.S. and Canada. The children’s hooded bathrobes fail to meet the flammability standard for children’s sleepwear, posing a risk of burn injuries. 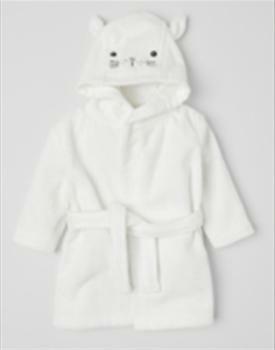 This recall involves H&M children’s hooded bathrobes that come in two styles; both are 100% cotton. The first style comes in gray with the inside lining in either white and pink or white and blue. The robe comes in sizes for 6 months to 3 years old and has a button closure on the right-hand side of the chest. The second style comes in sizes for 6-12 months, is white with an embroidered cat’s face on the hood, two ears attached to the top, and a belt. The robes, manufactured in China, were sold online at www.hm.com from October 2018, through March 2019, for between $25 and $30. Consumers may contact H&M toll-free at (855) 466-7467 from 7 a.m. to 12 a.m. (CT) any day of the week or online at https://www2.hm.com/en_us/customer-service/product-and-quality/recalled-items.html for more information.